LMT .308 Modular Weapon System (MWS) Monolithic Rail Platform (MRP) Semi-Auto 7.62mm NATO Tactical AR Battle Rifle/Carbine | DefenseReview.com (DR): An online tactical technology and military defense technology magazine with particular focus on the latest and greatest tactical firearms news (tactical gun news), tactical gear news and tactical shooting news. 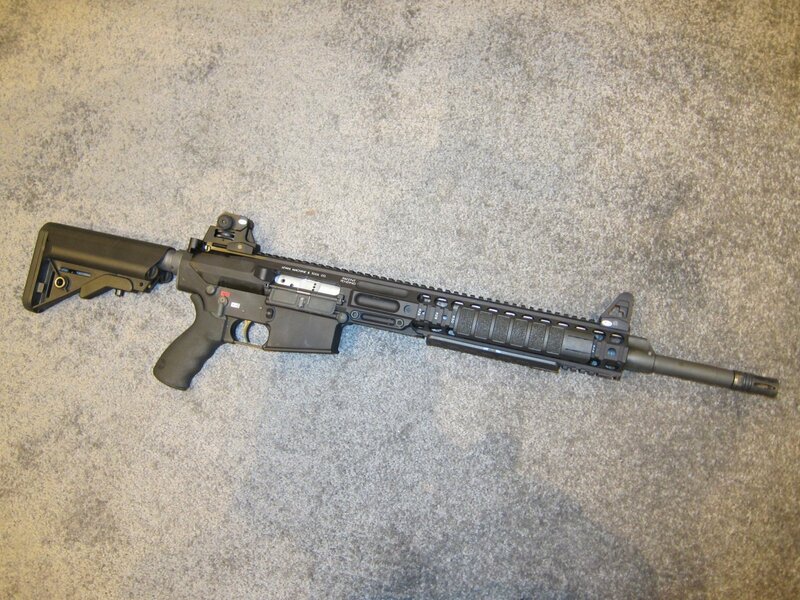 The Lewis Machine & Tool (LMT) LM308MWSE Monolothic Rail Platform (MRP) 7.62x51mm NATO (7.62mm NATO)/.308 Win. 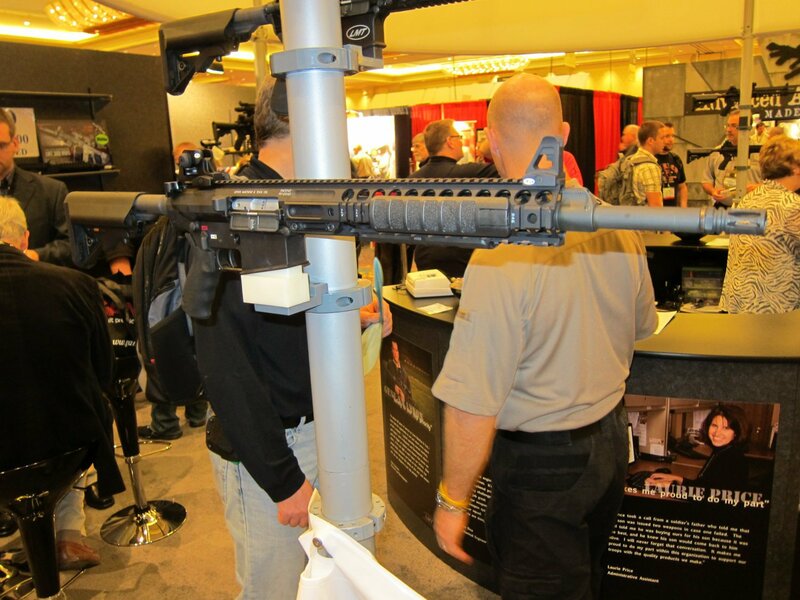 (civilian legal) tactical AR rifle/carbine generated a lot of attention and interest at SHOT Show 2010. We presume that "LM308MWSE" stands for "LMT .308 Modular Weapon System Semi-Automatic". 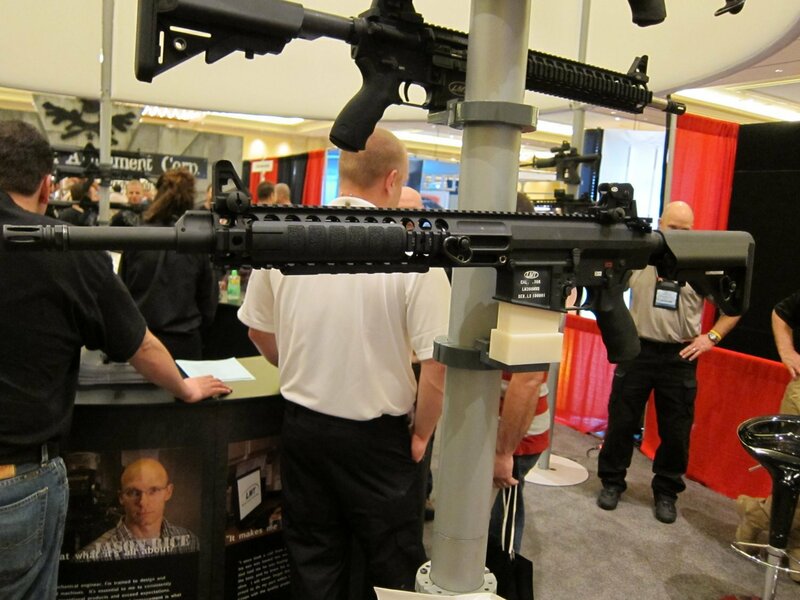 The LMT LM308MWSE 7.62mm rifle/carbine operates via direct gas impingement (DGI) a.k.a. direct impingement gas (DI gas) and has been adopted by the British Army, reportedly beating out the HK417 gas piston/op-rod AR rifle/carbine for the contract. The Brits ordered 440 units, designated the weapon the LM7, and then reportedly redesignated it the L129A1. The purpose of the L129A1 is to provide British military forces with a 7.62mm semi-auto "sharpshooter" weapon enabling designated marksmen to accurately and reliably engage targets out to 800 meters. Magazine capacity is 20 rounds, which allows for a lot of fast follow-up shots against fast-moving enemy targets, including vehicles. The MRP freefloats the barrel in order to maximize accuracy. 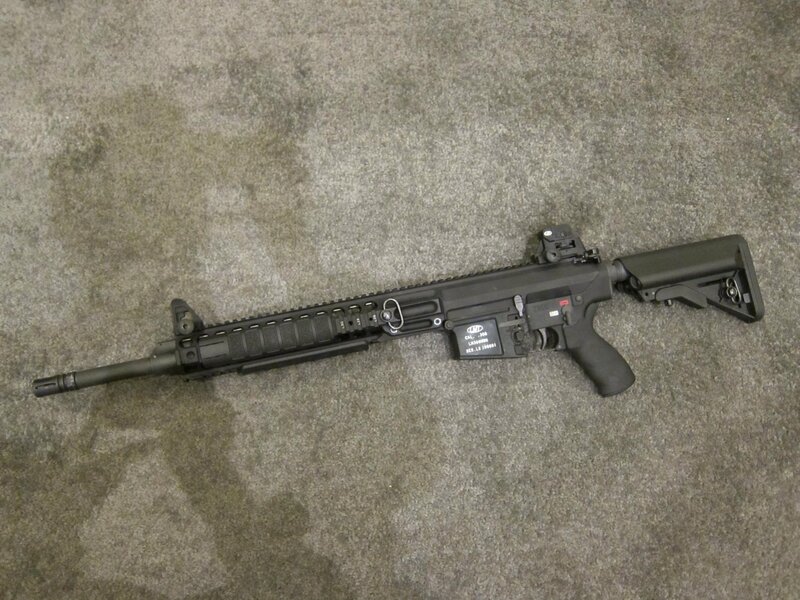 DefenseReview was informed (at SHOT Show 2010) that the British Army found the LMT .308 MWS MRP (LM308MWSE)/LM7/L129A1 battle rifle to be both more accurate AND more reliable under military combat test conditions than the HK 417. This is interesting, since the LMT .308 is a direct-gas-impingement (DGI) AR rifle/carbine, and the HK417 is a gas piston/op-rod AR. Hm. It would seem that piston-driven ARs aren't always superior to direct gas ARs. Interesting. I wonder what publication has been writing about that very truth. Oh, yeah. That's right…it was US! barrel will be available once military contracts are fulfilled. ambi selector and SOPMOD stock. 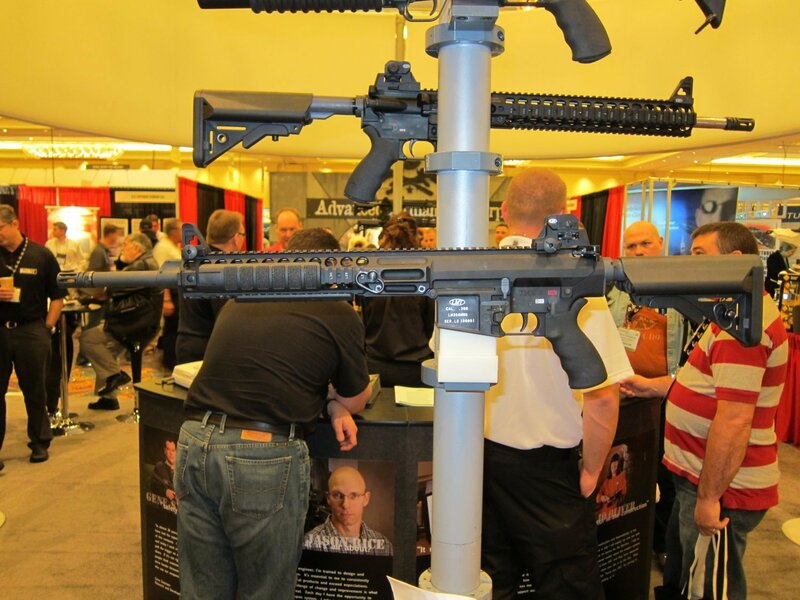 Top rail surface = 19.25"
3, 6, and 9 o'clock rail length = 9"
Overall upper receiver length is 21.2"
DefenseReview got to view and handle the LMT LM308MWS at SHOT Show 2010, and the weapon looked and felt good. We haven't test-fired it, yet, though. LMT CQB MRP Defender Model 16 (MSRP: $1829.28) and LMT CQB MRP Defender Model Piston 16 (MSRP: $2054.85) 5.55x45mm NATO (5.56mm NATO)/.223 Rem. rifle/carbines, and we really like them. 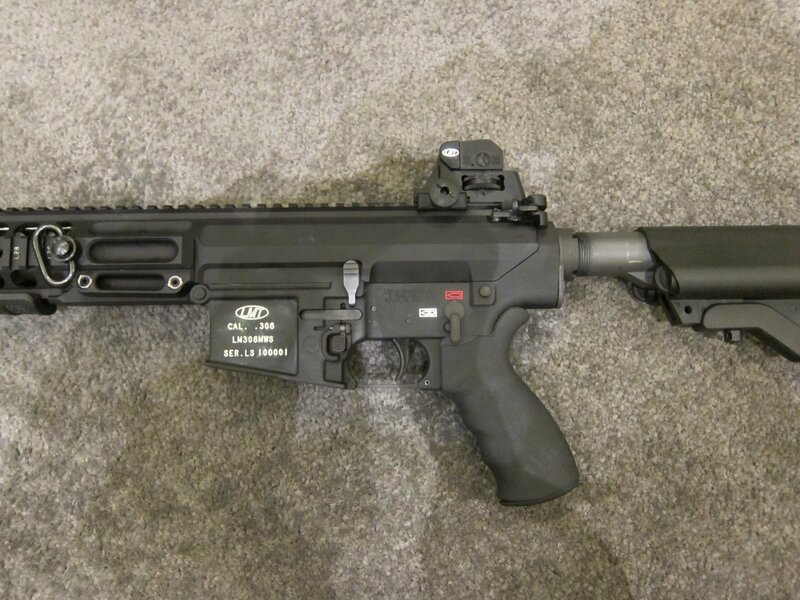 In fact, Defense Review test-fired the LMT CQB MRP Defender Model Piston 16 prototype at the Knight's Armament Co. (KAC) range in Titusville, FL during SHOT Show 2007. DefenseReview recommends that our readers check these weapons out at the LMT website. Previous: Smartphone Airstrike: Need to call in an airstrike? There’s an app for that. Need to kill bad guys? Just smartphone it in. Next: Iron Ridge Arms IRA-X (formerly IRA-10) Complete Sniper Rifle/Battle Rifle: This time, Thor’s hammer takes the form a 7.62mm/.308 tactical AR sniper rifle/carbine.